Has your cellular data stopped working? Had iMessage and FaceTime gone down after installing the iOS jailbreak? Don’t worry; it’s easy to fix. Luca Todesco has told us of a fix that should work, and it is a simple solution. While it’s great to be able to jailbreak, the iOS 10 utility is in beta format and has caused a few issues with some devices. This is one of them and, provided you follow the steps carefully, it is not difficult to do. One at a time for these commands and tap on Enter after each one so it gets executed correctly. 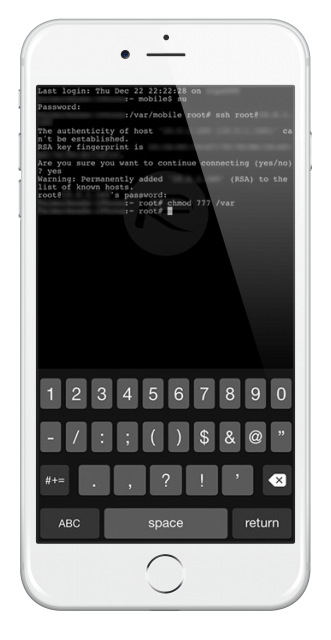 What these commands do is ensure that some privileges for specified parts of the iOS are changed; chmod 777 tells those directories that all users have permission to read, write and execute. This should fix any problems you had with your cellular data, Facetime and/or iMessage crashing after you installed the iOS 10 jailbreak. If you don’t feel confident doing this, don’t. You may have to settle for deleting the jailbreak and waiting until it is more stable. Want more like this? Follow us on Facebook for all the latest tips and news.